1. Haunt the email inbox, checking at least twice hourly, looking for the editor’s name to pop up. 2. When the edit letter arrives, read it in one gulp. 3. Go full-on George Michael Bluth for a bit. 5. Open up the Word document and read the comments. Count how many of each: Ha!, LOL, and smiley face. 10. Send off a MUCH BETTER BOOK. Huzzah! It’s really easy when you break it down. But that Step 8 is a doozy. While I was in San Antonio last week, my choice of footwear downgraded every day from “nice but pinchy” to “at least I won’t pick up smallpox in the crosswalk.” Today I have no shoes at all. The writer’s joke is about how nice it is to wear yoga pants or no pants. I don’t own yoga pants, but no pants is no option either so I wear knit shorts that should never be seen in public but will keep me from being arrested if the unforeseen should happen. But this is not a post about my bad fashion choices. This is a celebration of the national conference in San Antonio and a small announcement: I’m starting a newsletter. Yes, I’ll be the last person to put words on the screen to do so, but I’m totally going to do it. I vow to send out this newsletter no more often than once a month (and probably less if I’m being totally honest) and to include stories, pictures of my dog Jack, random flotsam that floats to the top of my brain, and giveaways. To celebrate and build the list for the September 1 newsletter, I’m going to run a giveaway of one $25 Visa card, the winner to be chosen from people who subscribe by September 1. Yep, just subscribe to enter. Here’s the link to sign up for my awesome NEWSLETTER: http://eepurl.com/ZTY25 I will mail internationally but I think the cards are limited to US usage. 10. 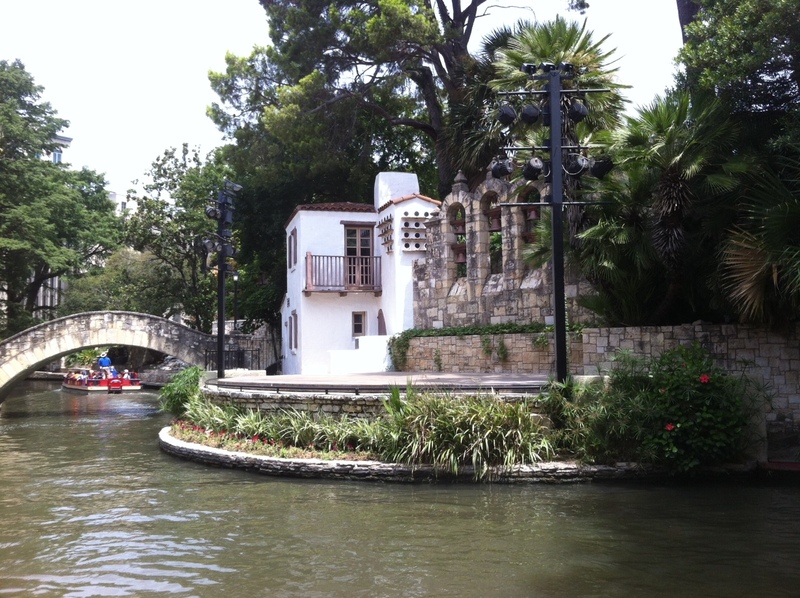 The Riverwalk is lovely. Really. And if you can see it from the inside of an air conditioned bubble, July is a nice time to explore. I took a boat tour and then I started walking. Walking was a bad idea. And I don’t know if I ever recovered from it. But the tour guy was great: educational, funny, and we didn’t crash into anything. All good. This stage is featured in Miss Congeniality. I put my life on the heatstroke line to get this photo. Please enjoy. 9. The literacy signing was so much fun. I sat next to Lynn Raye Harris. And I snagged some of her traffic, a skill I’ve gotten much better at over the last year. 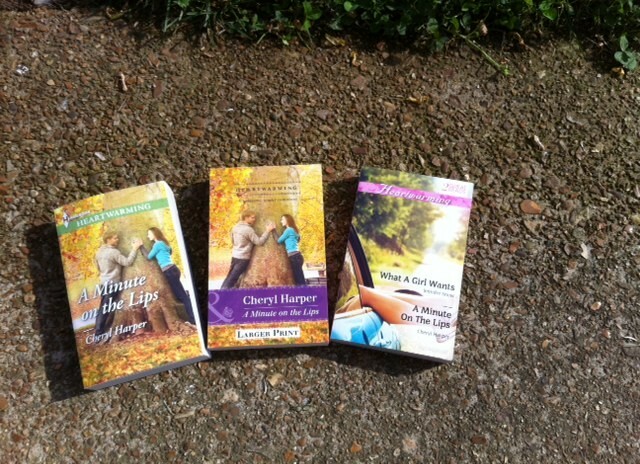 I sold most of my Avon books and talked up Heartwarming to sell several of those. Here’s my view and evidence of my solid merchandising skills. Retail jobs for the win! 8. I also gave away so many pens and sticky note pads I feel vindicated in giving the UPS guy a muscle twinge (he’s strong but it was a lot of boxes). 7. I did not cause an international incident with my stomach distress. I also only missed one or two events. I consider this a personal victory. 6. I discovered that Heartwarming Senior Editor Victoria Curran and I would probably be the best of bosom friends (something about Canadians makes me think in terms of Anne Shirley. It’s a thing with me) if only she didn’t live alllll the way in Canada. I might need to renew my passport to take a trip to see the Harlequin mothership. 5. I met the Harlequin Heartwarming authors at the conference and I am telling you that these ladies are so smart and business savvy and on top of that they will make you laugh and encourage you when you need it. That’s an amazing group to be a part of and I feel so lucky to be included. 4. 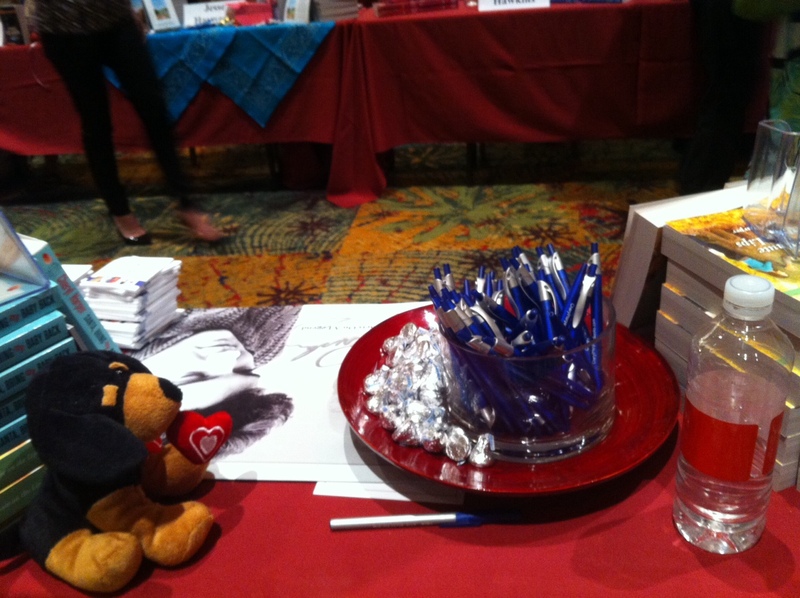 I caught up with Avon friends and am reminded how awesome romance writers can be. 3. I went to the best workshop on conflict. I think something clicked in my brain. I’m hoping it wasn’t the Pepto Bismol causing misfires. 2. I got to sit down with Avon editor Chelsey Emmelhainz and just talk. It was great. 1. On the twelve-hour drive home, I did some heavy thinking about what I need to do next. I also have three new ideas that I want to write right now. I hope that wasn’t the Pepto Bismol causing misfires too. More seriously, I spent some timing thinking about whether I should drop an idea I was trying to force because it’s in a hot genre now to go with what I know and love. I think I might even know the answer but whether I’ll go with it remains to be seen. Writing conferences are expensive and the travel can be hard (especially when you’ve picked up the plague somewhere) but they are such a creative boost. Being surrounded by the energy of positive people like romance writers is the kind of shot I need to keep struggling and working at this. If you haven’t tried it, maybe it would be the same for you. Next year: NEW YORK. I hear if you can make it there, you can make it anywhere. Now, go sign up for the newsletter. And check out my Facebook page. I have another contest going there, along with pictures of my dog Jack. First things first: Happy Memorial Day. Please remember the service and sacrifice military men and women and their families make and say thank you if you can. I didn’t look at the date of my last post because I had to really think, think, think to remember how to log on so that’s way too long. Thus, long post ahead! 1. I’m working on THREE more books for Harlequin Heartwarming and I AM ALL EXCITE about this. We’ll be going back to Tall Pines to visit a beautiful bed and breakfast on lovely Spring Lake, and then we’re changing scenery, going a little international, and then going to the dogs and cats and…well, we’ll have to see! I love all three concepts, so let’s see how well I can pull them off. While I’ve been away, the 2-in-1 version of A Minute on the Lips for sale in Australia arrived. SHINY! Also, “G’day, mate. Throw another shrimp on the barbie.” That’s all the Australian I know. Here’s the whole international family: A Minute on the Lips, its British cousin, and the Australian branch. 2. I drove down to the RT Booklovers’ Convention in New Orleans at some point this month. All my days are blurred together, you know? It was my first visit to New Orleans and my first RT. Highlights: hanging with my friend Codi Gary, meeting Sara from Harlequin Junkie, peeking at Lisa Kleypas at the Avon party at Acme Oyster House, and shaking Charlaine Harris’s hand, and…there are many! 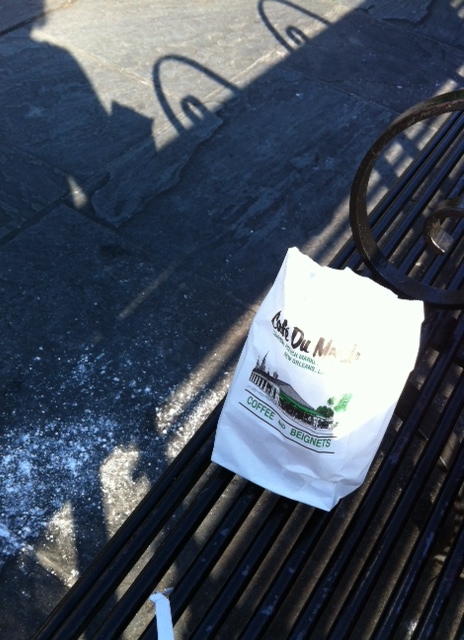 After all the convention excitement and actually meeting FANS (I mean, of MY books, not just people who like to read because I love those but people who talk about my characters and are not actually named my best friend…that’s like whoa), I went to Cafe du Monde, had beignets, and this view. 3. I drove to Florida, camped out under an umbrella, and listened to the waves with the person named my best friend. It was awesome. We watched the beach attendant. We shopped. And did I mention it was awesome? Because it was. When we decided to exert ourselves, we visited the Gulfarium and I learned that I need a 13-stroke handicap to play minigolf on the pink course at the Big Kahuna. That was a sobering realization. Obviously I need to work on my putt-putt golf stroke. 4. I drove home. The ginormous yard had returned to its natural, jungle-like state, the mail was out of control, and the dog was mad. 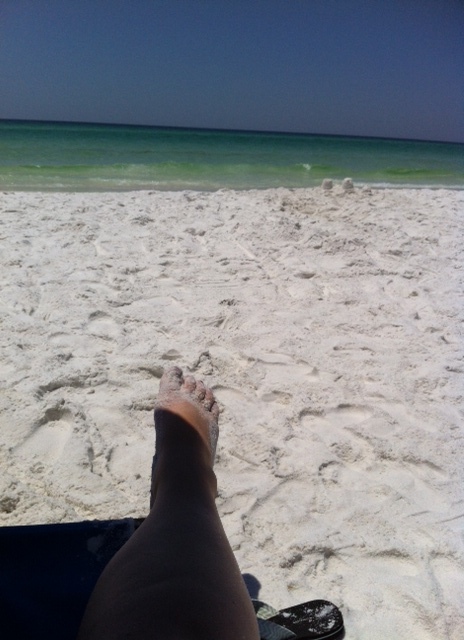 If they didn’t keep the beach so far away, I would have just jumped right back in the car. Eleven days, 1500 miles, 27 hours in the car. After I fought my way out of the paper bag that is streets I’ve driven my whole life and still managed to miss my turns, I did it flawlessly. 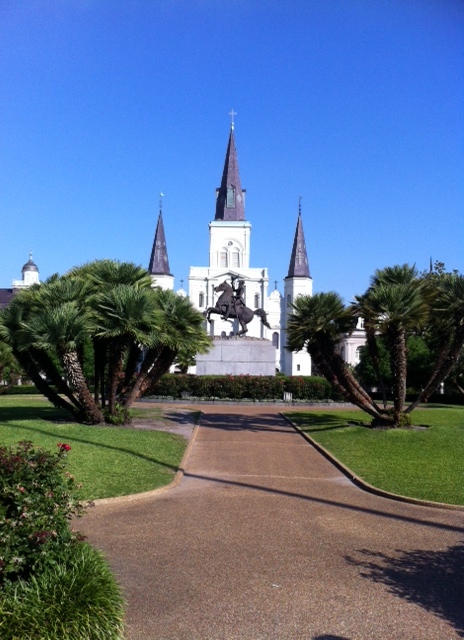 There was some circling of the hotel in New Orleans, but I blame traffic, construction, and one-way streets for that. 5. Now I must write like the wind. Yesterday was a solid day of 5,000 words. I’m looking at my deadline and doing the math on my fingers and thinking there’s totally a chance I could still possibly make it. Maybe. Everyone keep your fingers crossed for me, ‘mkay? While I write, this song is playing in my head. The Bandit is my driving inspiration, after all. I’m just going to get in the rocking chair and put the pedal to the metal.